To celebrate the new Star Bolt, Star Sponsored a custom build-off in which 10 builders received Bolts to modify. You can see all 10 entries here. These photos are hosted by Star’s website. Hageman Motorcycles (fomerly Doc’s Chops) won this competition over several other accomplished customizers, including Roland Sands. Greg Hageman, owner of Hageman Motorcycles, has been featured on the Discovery Channel’s “Cafe Racer” with two other builds. The beauty of Hageman’s designs is their simplicity, particularly the Star Bolt custom which has led to an inexpensive kit being sold by Hageman on ebay. The bolt-on (no pun intended) kit retails for $1,120, and transforms a Bolt (together with some additional parts) into a convincing, high-fender Scrambler (pictured below). Valentino’s #thisisforSIC58 is Now Officially Up for Auction! This is the bike Yamaha should come out with instead of the Bolt. The world doesn’t really need another cruiser, there’s plenty of those. A nice retro standard like this would be nice. There’s a little too much missing from that eBay kit for this to actually be affordable, but if Yamaha came out with a production version, I’d be interested. I tried out a Kawasaki W650 twin at my local bike shop. The seat was too low, I was too cramped, and the short travel suspension was a bit erratic going through bumpy turns (and most of the turns were bumpy). I then tried a “scrambler” style bike based on a Suzuki DR650, called the Freewind (lousy name…). The Freewind had nice long travel suspension but still a low enough seat, and was smooth as silk railing through the turns. What bumps? The extra suspension just ironed out the road like it was brand new. The motor can’t compete with the smoothness of a twin, but there was some get up and boogie in the midrange. Upshot? I bought the (cheaper) Suzuki because it had the roadholding and comfort I would need. That’s the difference between style and function. And I didn’t have the extra money… The Freewind is still running all these years later. I think it’s cool, and love it, even if it is a bit silly – particularly the one with offroad tires, because there’s scant ground clearance for offroad use. Looks fantastic, though, and like it would be fun to ride. You don’t need increased ground clearance to ride most gravel roads, just better tires. I’ve put dual sport tires on two street bikes to explore gravel roads and it helps a lot. I always love reading the comments about new/retro/custom bikes! First, the MC community typically says “give us something new, different, or retro!” Next, is “booo, this is too weird, this has already been done, (or the ever popular) this bike is only for posers!” Gentlemen, how about “hey, anything on two wheels is a kick, and while this might not be my taste, let’s appreciate the effort”. Yeah, Scramblers are mostly road, always have been, always will be. Cool bike, great retro look, Keep it up Hageman! To me scramblers are like SUVs. More off-road looks than actual ability. Wow, it is very long. Great looking bike, I hope I get to see one on the road some day. A pig with mud on her dress, is still a pig. It’s the “Look”, that most like. I like it, but it’s really not practical. So we’re all totally okay with the tank seams now, are we? What my eye went to first… No. Tank seams are the new black. Had one that looked just like this modified Bolt. I would ride it! Dual sport tires are less rough to ride on roads. Hot dang that looks good. I think part of what makes the package so great is the tires, I’d toss a pair of those off road knobbies on there even at the expense of great road manners. Sometimes style is king. Nice job, I’d ride it! Nice looking bike. But hard to tell what the riding position will be. The bars seem pretty high/seat’s still kind of low. Again, as a styling exercise it’s cool. But real world, making a cruiser into a sporty bike just seems futile. 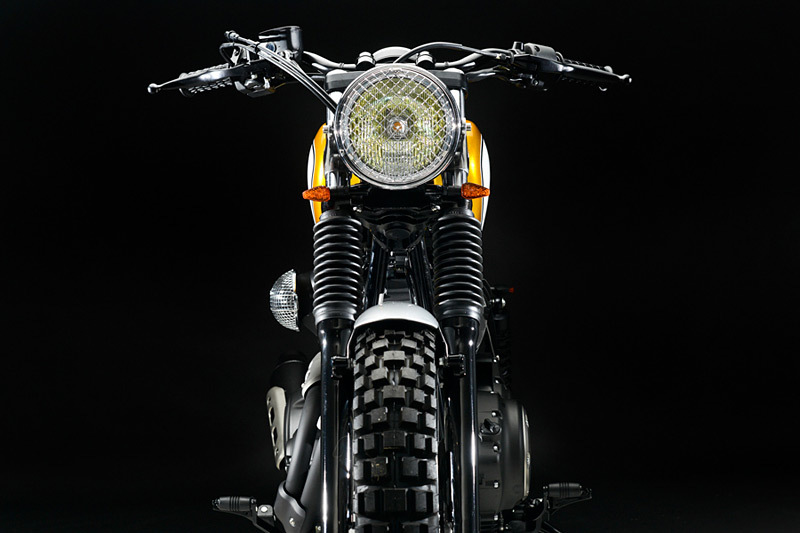 I’d just get a lighter Triumph scrambler which is the real thing anyway. I wish the Japanese would get with the program and build some retro-style scramblers. Those 1970’s DT Enduro colors are what make this bike so cool. The rest I can do without. A “lowered” XT650 based scrambler with these colors would sell well I think. Or a similar Honda XR650 in early 70s XL colors. PS .. I will say that this bike looks great in person. I saw it at the NYC show. It is an amazing achievement to transform this Bolt cruiser into a cool retro scrambler. It was by far the best custom Bolt in the competition. That said, I would not want the weight or the length of this platform for a scrambler. As to why scramblers are popular right now? They have a vintage look but are still a usefully bike. 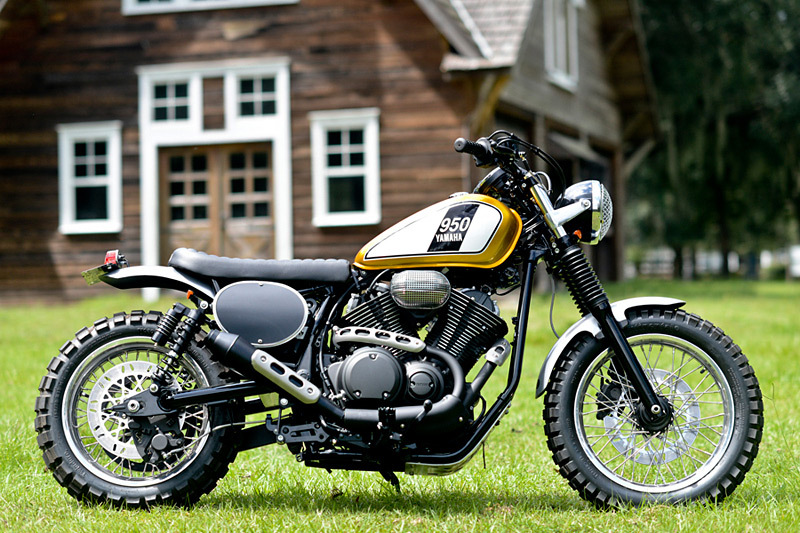 Scramblers are basically standards with high pipes and dual sport tires. I have no doubt that this scrambler would ride much better than a stock bolt with the practical seating position and longer suspension travel. They won’t replace dirt bikes but would have no trouble on a gravel fire road. Zombie apocalypse is coming…. we’ll all need scramblers to get around once the roads start to deteriorate. Once the roads start to deteriorate? I invite you to ride in Alabama, the roads started to deteriorate decades ago. Perfect. Just get on and ride. The rear cylinder head is literally right at your left knee when you sit on the stock Bolt, so getting just a tad higher is what you need. The rear shocks were also too short for New England. Any place you get snow in the winter, the roads will be rough. Down South it’s all good. I had a sportster. It was rough which was nice on quick rides. But I would have appreciated overhead cams and balancing. I think if most people owned a bike like this, they would want to ride it. Basic. Fun. Fast without being too fast. Plenty of aftermarket. Great looking bike! And if the story was to be believed, it could be yours for under $10,000. Unfortunately, spending $1,120 will not get you “the convincing high fendered Scrambler (pictured below. The Ebay kit only contains a bolt on subframe and hardware, lightweight but comfortable seat, heavy duty 1/4 thick dual mold rear fender, and number plates and brackets. Then you still have to buy the bash plate, front fender, and tank vinyl (which Hageman sells). Then you need to lay out for the wheels and tires. Oh, and of course the exhaust has to be modified as well to get that “Scrambler” look. Then to be functional, suspension upgrades by Works and then maybe you would have the bike pictured. Again, not taking away from the bike, it is awesome and something I would love to own. My problem is the story making it seem like it might be within my reach, when upon further investigation, it would be alot more than the $1,120 extra quoted in the story. I saw the bike at the IMS and thought that is the Bolt Yamaha should have built. Kudos to the builder for making the kit available. Did you see the SR with the scrambler treatment? They had the 2015 Yamaha SR400 by Palhegyi Design at Daytona. I saw that and asked the rep if they had plans for that version. Wow! This was at the Dallas show last year, and the SR400 was yet to be announced, so no, I didn’t see it. I have seen pics of it though, and it looks absolutely delicious! I saw that “TT400” concept bike at Daytona too… AWESOME! 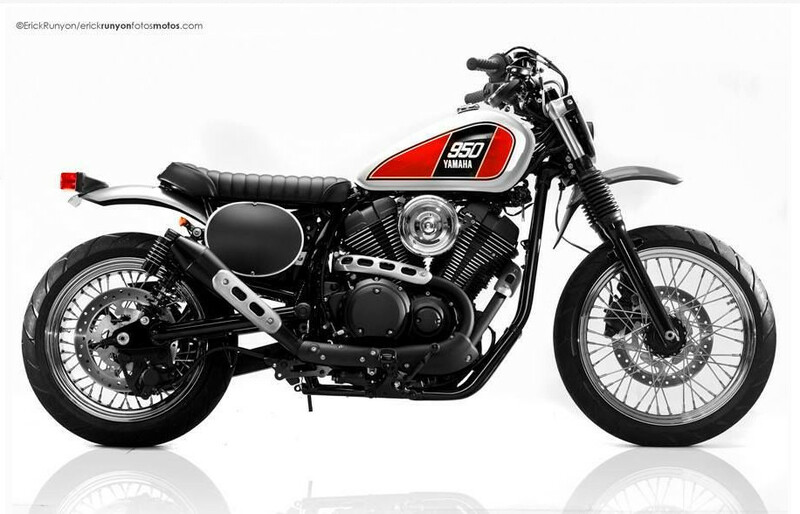 This Bolt custom is cool, but THAT is the bike Yamaha should build!!! Good looking bike. 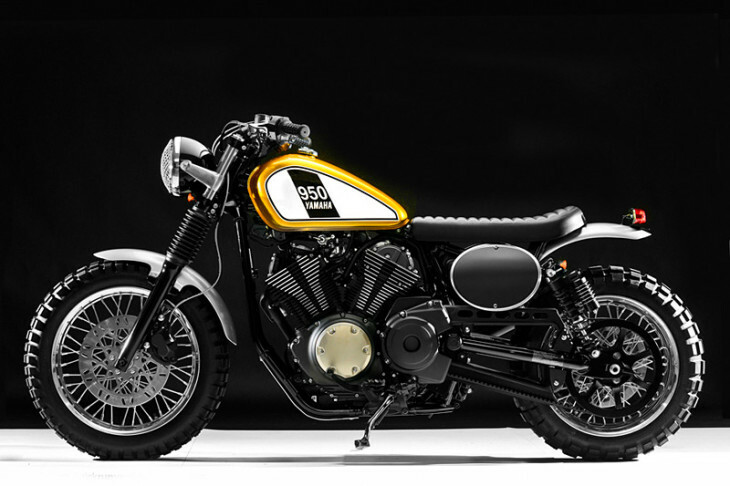 Accurate name would be Street Scrambler. Yamaha could likely sell a bunch of these. 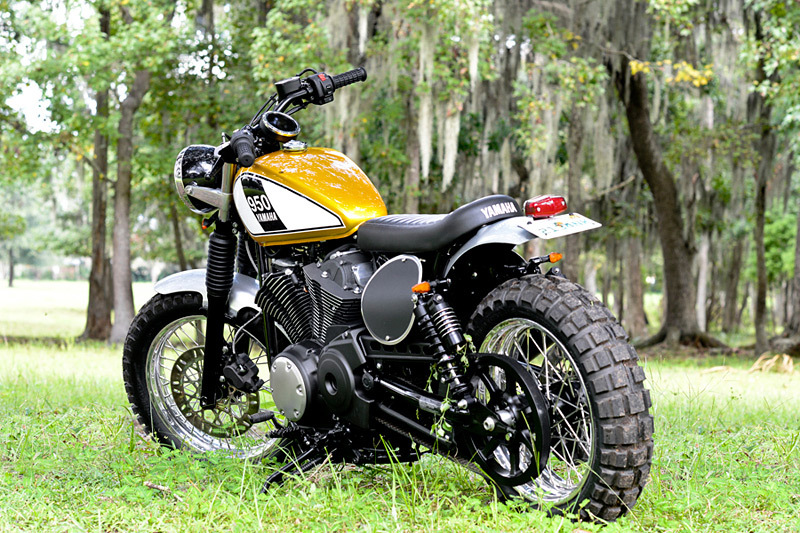 Number one reason why scramblers are liked: Seat height is low enough to throw your leg over. We all enjoy the idea of tearing up a dirt road in the back range. But, dirt bikes, Adventure bikes, and KLR types are just too freakishly tall now. Scramblers harken back to the days when we could actually get on our bikes and ride the snot out of them. Much better looking bolt than what Yamaha put out. Sorry Yamaha, but kudo’s to you for doing this. Maybe next years will look better because of this. Very nice, but best not take it offroad with that belt drive. I have read in several pubs that a twig or vine getting between the belt and the rear pulley can derail the belt. I can’t speak for the Bolt, but I have put plenty of off-road hours on a belt-driven Buell Ulysses without ever derailing the belt. Perhaps it isn’t such a big concern? New category has been born; it was long in waiting. Go on Yamaha, unveil more versions of this in ready to buy form! Looks great. Yamaha should release the XS-V1 Sakura, after seeing these custom efforts. I live in hope. H-D, eat your heart out! Wow, what a ride. You gotta give Yamaha credit for allowing someone to prove how mediocre was their original design compared to this beauty. How costly is it to squeeze more torque and/or power from this motor? What can you expect from old crusty attitude? Beautiful bike, but question, why is so popular (or so requested) the scrambler look on bikes? Not sure if function follows form. Or is it me that I’m a paved (and very nice paved) road being? It has a scrambler look w/o any suspension to make it real for the dirt. Only posers need apply. I stand corrected after closer look.